Chee-lah-kee-lays! Even just saying that word out loud is enough to put you in a brighter mood. 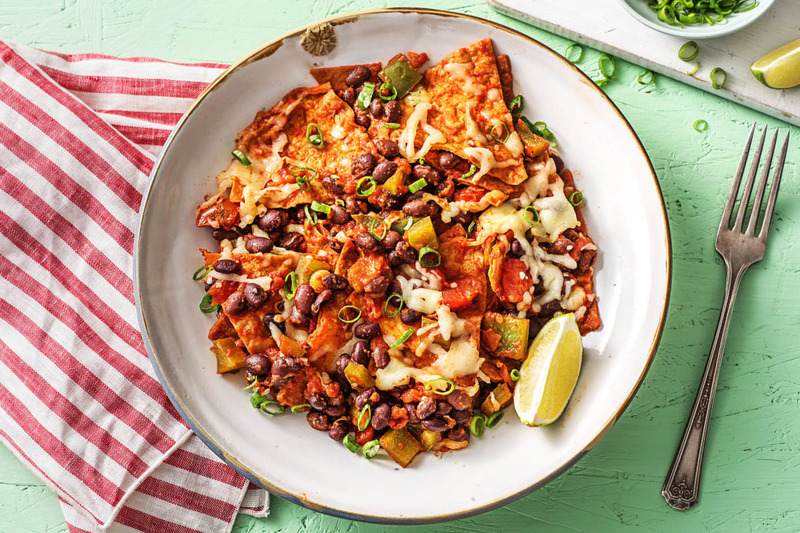 And if you haven’t yet discovered the wonder that is chilaquiles, think of it as what happens when nachos go saucy. 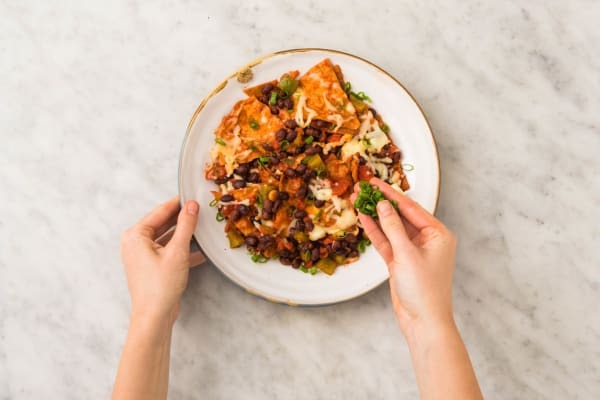 First, the tortilla pieces are smothered in a feisty mix of black beans, diced tomatoes, and smoky chili. Then, everything is sprinkled with pepper jack cheese and allowed to get piping hot and melty under the broiler—a Mexican-style meal of champions, achieved. Wash and dry all produce. Preheat oven to 400 degrees. Trim and thinly slice scallions, separating greens and whites. Core and seed poblano, then cut into ½-inch pieces. Zest and then halve lime; squeeze juice from one half into a small bowl. 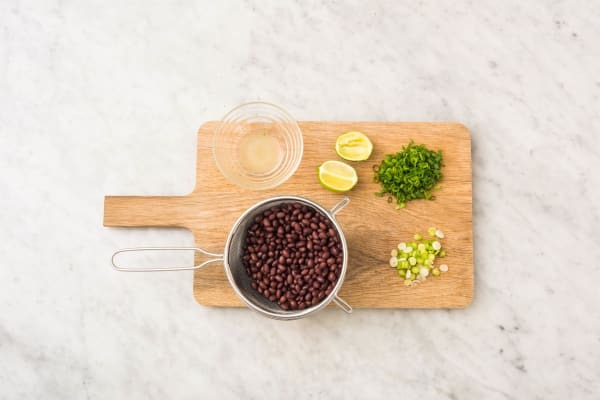 Drain and rinse black beans. 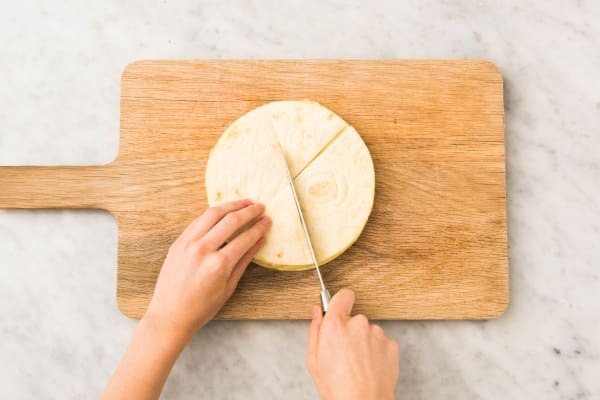 Place tortillas in a stack on your cutting board. 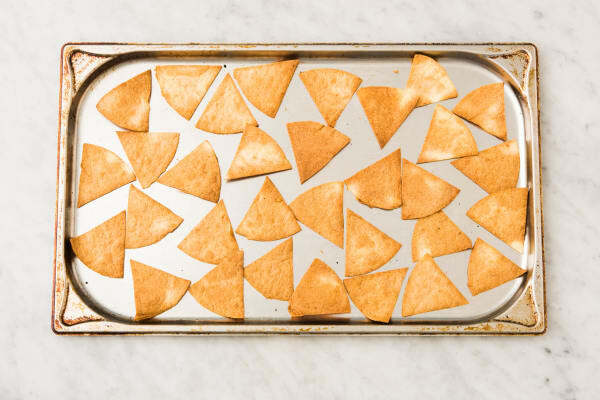 Cut stack in half, then cut each half in thirds, creating six smaller stacks of chip-shaped wedges. Place tortillas on a baking sheet and sprinkle with a large drizzle of olive oil. Season with salt and pepper. Toss to coat, then spread out evenly on sheet. Bake in oven until crisp and golden-brown, about 10 minutes. (TIP: Keep an eye out for any burning.) Remove from oven and set aside once done. Preheat broiler to high. Heat a drizzle of oil in a large, ovenproof pan over medium-high heat. Add scallion whites and poblano. Cook until soft, about 4 minutes. 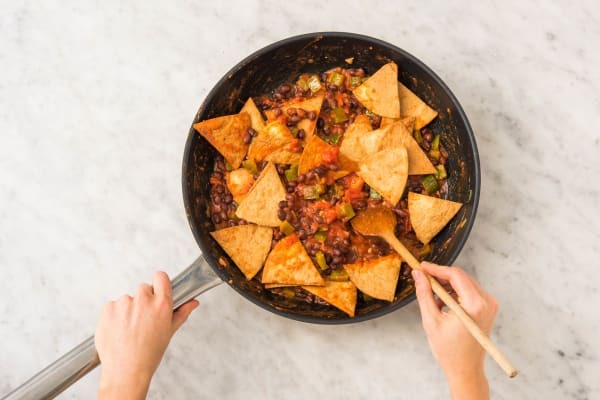 Add tomatoes, beans, ¼ tsp chipotle powder (add more for additional heat), lime zest, reserved lime juice, and tortilla chips, stirring to combine and coat chips. Cook, stirring, until chips soften, about 2 minutes. 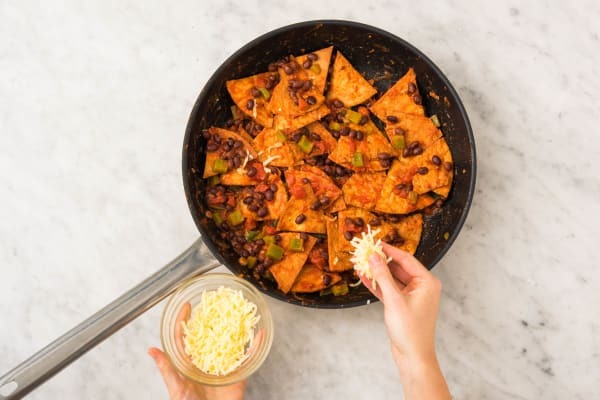 Remove pan from heat, then sprinkle cheese over chilaquiles in pan. Place pan under broiler and broil, watching carefully, until cheese melts, about 1 minute. Divide chilaquiles between plates. Sprinkle with scallion greens and serve. TIP: Cut the remaining lime half into wedges for squeezing over, if desired, or save it for another use.